Im assuming the Droid doesnt come with HTC’s touch input keyboard? You should look around for that, ite much better than the default Android keyboard, and it has the hold-for-options function you mention. Android requires more time and commitment to trial/error and research to figure out how to do simple things than it should, and I totally agree with the list of places it needs to improve that you mentioned. But you found all of the good stuff, and that’s fantastic–not because I’m a diehard Android loyalist, but because like you said, competition means innovation, which means better choices for everyone. I came across your blog while checking out your article on winter biking gear, and as a new Android user, I also have a tip for you to use. In your contacts, hit your menu button, and then go to “Display Settings” and then there is an option to show only the people with a phone number on their info. Just make sure those people you really like have a phone number listed, or you will only be able to find them with a search. I have the HTC Eris Droid (no hardware keyboard) and like it a lot. Never used any other smartphone, so can’t compare to iPhone or other. It’s pretty intuitive for me. I know what you mean about the Gmail contacts — the people I email — being brought over, and how those aren’t the people I call or whose phone numbers I’ve saved in Gmail, but when I go use the phone, only the ones with phone numbers pop up, which makes things easy. One thing you said, Matt: “The Android ecosystem doesn’t require a computer at all. At first I found this slightly frustrating as it takes some tweaking to get music on or off the device” — HOW did you do this? I can’t figure out how to get music on or off without the PC. I would love to delete some music I added on the fly without having to remount the phone to the computer. I have only found the clunky file manager AndBrowser to allow direct deleting of files from the phone. 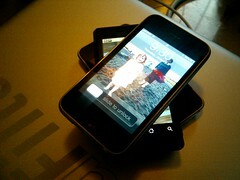 The trackball on the Nexus One is great for correcting a typo deep in the text you are typing. It is THE way to move the text cursor on the phone. When C got his G1 last year, this made the setup phase fairly awkward — even worse was combining people who may have been listed by their actual name in Gmail but by an obscure nickname or initials on his old phone. I think after however many months it’s been he’s got it pretty well worked out, though. Glad to hear you’re having some success with your Droids of Many Flavors. I had THE Droid, actually, two of them, in the first two weeks they came out, and had to go back twice because they kept rebooting themselves. Swapped out to an Eris (thanks VZ for the $35 fee to change a broken device to another one) and had it for a month or so. I liked the feel of the Eris much better than the Droid, as it was sleeker and easier to manage, working with it still felt pokey to me. My biggest area of complaint was with the lag in response time, especially when making calls or hanging up. I’d find myself in this vicious loop of doing one when I meant to do the other. As a long time VZ user, and a concurrent iPhone user from day one, I’ve carried a device on both networks since the iPhone released. The Droid is definitely the coolest device, and most iPhone to hit VZ, and if I didn’t have an iPhone, I’d likely try to make something work. However, the other day I reached into my coat pocket, and my Eris screen was shattered. I have no idea what happened, I had checked email just a few minutes prior, and had nothing else in that pocket. I was leaving the office, so just normal stuff, no elephant wrestling or anything. Anyway, since I was coughing up cash to replace a new device, I just spent the extra $50 and jumped back over to a BB device and am trying out the Tour now. Using my iPhone for my super smart phone, app downloading, media playing device. I’d give the droids about an 80% of where the iPhone is, and don’t doubt that by the end of the year, or sooner, they’ll be playing in the same field.